Is this familiar: a bumblebee descends on a flower, you click the shutter, but of course the result is fuzzy and you wait for a new bumblebee. A new one approaches in fast flight but just before landing seems to bounce off. Click – and another photo gone awry. Everyone who has observed the doings of bumblebees on flowers for some length of time has noticed that if a bumblebee has visited the flower and collected the nectar, then it will take some time to wait for another bumblebee to land on the same flower. It happens especially on single blooms, for instance the bells of comfrey (Symphytum) and bumblebee researchers had noticed it too. 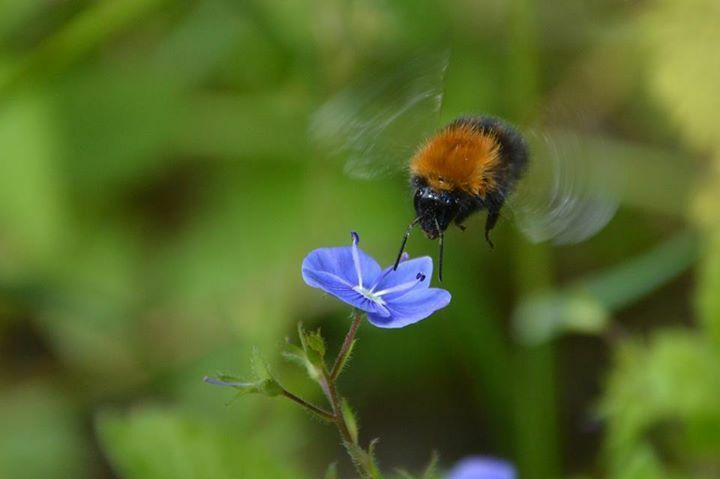 To clarify the point researchers measured the amount of nectar in the flowers that did not suit the bumblebees and in those where they decided to land. It turned out that there was much more nectar in the flowers where they decided to land. But how do the bumblebees know which flower is sucked empty of nectar and which is not? Do they check the amount of nectar visually? Firstly, it was tested how bumblebees behave if flowers emptied by bumblebees were filled with nectar again. Result: bumblebees avoided the flower as before. After this the flowers empty of nectar were covered with a net to keep insects away and to allow the flower to replace the nectar again. Before removing the net the flowers were emptied of nectar. Result: many bumblebees descended on the flower and were disappointed. So the solution could not be in seeing the amount of nectar in the flower because irrespective of whether the flower was filled with nectar or empty, the bumblebees landed only on the flowers where no pollinator had landed for a long time. Thus the ”stinking feet hypothesis” began to emerge – on landing on the flower the pollinators leave a scent mark which announces to other insects that on this flower there is no point in landing for some time. The body of bumblebees is covered with a thin layer of fat that helps them stay ”waterproof” , but which also leaves a specific scent trace. The antennae are constructed so that they detect these traces. Thus a few molecules of smell are sufficient for a bumblebee that approaches a flower to understand that someone has recently visited the flower and probably emptied it. When the flower has filled with new nectar the pollinators are there again. But how bumblebees know how old the scent trail on a flower is remains a riddle as before. Specifically it was found recently that the ”smell” of the bumblebee does not disappear from the flower that has refilled with nectar but remains there for a much longer time. Now, considering this, a bumblebee has to visit thousands of flowers filled with nectar to feed itself and to carry food to the nest. Each landing and check on a flower for nectar that is not present would add to an enormous cost of energy and time, the avoidance of which would be an advantage for the bumblebee itself as well as the entire colony. So sometimes stinking feet are quite useful.